Another beautiful 79 degree day on Guanabara Bay. 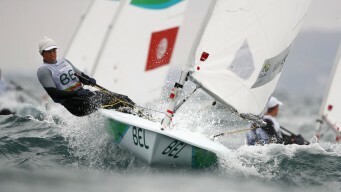 The medal races in the women's and men's 470 classes of the Rio Olympics sailing regatta have been postponed because of lack of steady wind on the Sugarloaf Course off Flamengo Beach. 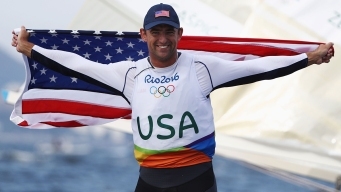 Santiago Lange, a cancer survivor and six-time Olympian, and crewmember Cecilia Carranza Saroli won the first Olympic gold medal in the Nacra 17 mixed catamaran class Tuesday at the sailing regatta. 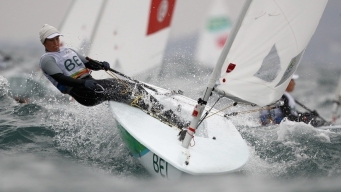 RIO DE JANEIRO (AP) — Catamarans are back in Olympic sailing, with the kind of adrenaline rush that only a double-hulled boat can bring to the regatta. RIO DE JANEIRO (AP) -- The last guy who won the Olympic gold medal in sailing's Finn class was knighted by Princess Anne at Buckingham Palace a few months after the London Olympics.